Lake Jackson, a popular 4,000-acre lake located north of Tallahassee, Florida, in Leon County is geologically unique. The dissolution of limestone in years past caused overlying sediments to collapse and form a solution basin, creating the lake. Two active sinkholes in the bottom of the lake are remanent features of these karst processes - Lime Sink in the northern portion and Porter Hole Sink in the southern area. The lake is in a closed 27,000-acre drainage basin. Water flows into the lake but water can only leave through evaporation or leakage through sinkholes in the bottom of the lake. A number of other lakes in the region share this characteristic, although each lake has a unique, natural cycle. In the last stages, the lake has the appearance of draining rapidly as though someone pulled a plug from a bathtub, although in reality it has been draining slowly over time. When a combination of factors are present - below normal rainfall, low lake levels, below normal ground water levels and high rates of evaporation - water flowing into the sinkholes becomes more obvious. In the last stages, the lake has the appearance of draining rapidly as though someone pulled a plug from a bathtub, although in reality it has been draining slowly over time. 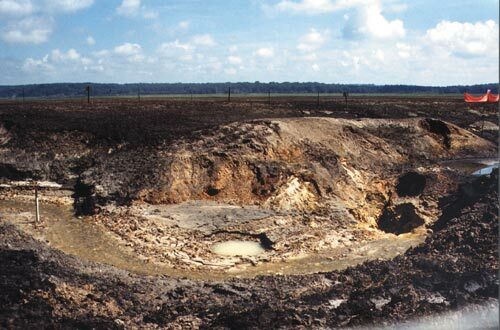 On September 16, 1999, most of the water remaining in the southern portion of Lake Jackson drained through Porter Hole Sink, an eight-foot wide sinkhole, leaving only isolated pools. The largest pool in the northwest portion of the lake drained slowly into Lime Sink over the next six months and in May 2000, this portion of the lake was completely dry. The first documented disappearance of the lake's water was in May of 1907. The lake also disappeared in 1909, 1932, 1935, 1936, 1957 and 1982. Today, water managers call this process a natural drawdown, dewatering, draining or drydown. Nonpoint source pollution contained in stormwater runoff is the major source of pollution for Florida's lakes, rivers, streams, creeks, estuaries and bays. Over the past three decades, the water quality and ecological functioning of Lake Jackson has declined as a result of nonpoint source pollution. In the early 1970s, Interstate-10 was constructed across northern Florida, traversing the Lake Jackson watershed. Urban and suburban development increased in the area and this growth was accompanied by increased stormwater runoff. Sediment, fertilizer, wastes, pesticides, herbicides, heavy metals, oil, gasoline and other pollutants were carried into Lake Jackson by runoff. In turn, the growth of nuisance plants, such as hydrilla, blue-green algae and water hyacinth, increased. As these plants proliferated, died and decomposed, a thick layer of organic muck built up in the bottom of the southern portion of the lake, covering the lake's sandy bottom and destroying fish breeding areas. In some locations, the muck was as deep as three feet. Nutrient cycling between the sediment, the vegetation and the water column resulted in dramatic ecological changes in the southern portion of the lake and a few other areas. As the ecological health of the lake declined, the Northwest Florida Water Management District, other state agencies and local governments became concerned and began to try to correct the problem. The logical first step was to treat the runoff before it entered the lake. In 1983, the Water Management District, with federal and state funding, constructed an experimental stormwater treatment facility near Interstate-10. Later, a cooperative agreement allowed another facility to be constructed on the opposite side of Interstate-10 to treat even more of the runoff. Subsequently, the City of Tallahassee and Leon County, in cooperation with other governmental entities, constructed five regional stormwater treatment facilities and four additional ones are planned. But the degradation of the lake had already occurred and removal of the accumulated sediment from the bottom of the lake appeared to be the appropriate solution. Removing the nutrient-rich sediment during a natural drydown was considered more cost effective than removing the sediment through hydraulic dredging with water still in the lake. The Northwest Florida Water Management District, in cooperation with other state agencies and local governmental entities, had already developed a Lake Jackson Management Plan through the state's Surface Water Improvement and Management (SWIM) program. This comprehensive management strategy recommended development of a contingency plan for removing years of accumulated muck on the bottom of Lake Jackson should the lake experience a natural drydown. "Contingency plans are not glamorous and it is difficult to sustain interest in developing such plans," said Tyler Macmillan, SWIM coordinator for Lake Jackson. "You don't know if you will ever get to implement it." "However, having a formal, approved watershed management plan allows those involved to agree upon the basic concepts and work toward development of specific action plans," he explained. "This is good watershed planning because it allows the problem to be identified and enables you to obtain a high level of agreement on the solution. This was particularly important with the drydown restoration project because delays might lessen the project's success." 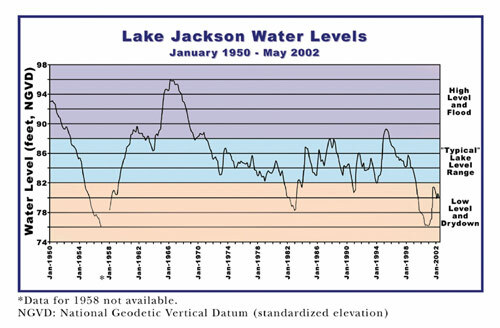 As the lake level declined in the spring of 1999, Macmillan convened a multi-agency technical working group to plan the restoration effort if, and when, the lake were to drydown. This group later became known as the Drawdown Interagency Restoration Team (DIRT). Strong citizen support and participation also were encouraged. The "teamwork" of this group has been credited with the project's high level of success. Macmillan acknowledges that his interest in Lake Jackson stems from his earlier, personal experiences. A long-time resident of Tallahassee, he grew up fishing in the lake. He vividly recalls, as a teenager, driving his truck on the exposed lake bottom in 1982 when it last drained, occasionally getting stuck in the muck. Undertaking needed research, such as laboratory analyses of the sediment, was the first step in implementing the project. Other steps included developing specific engineering plans, identifying phased activities or specific actions to take place when the water level dropped to a particular level and obtaining necessary permits. "Identifying the triggers, recognizing when they are there and then gearing up quickly to begin the restoration effort was crucial to the success of the project," explained Macmillan. "An action plan was developed that clearly established the priorities and critical tasks." When it became evident that the lake was likely to drain, time became a crucial factor in implementing the restoration project. An ongoing threat was that the lake would refill before there was time to secure local, state and federal environmental permits and mobilize contractors. In 1982, the lake refilled in about four months. How much time would be available to remove the muck could not be predicted. - story continued below. An experimental stormwater treatment facility, the Lake Jackson Meginnis Arm Stormwater Treatment Facility, constructed along I-10 in 1983 by the Northwest Florida Water Management District, Florida Department of Environmental Protection and the U.S. Environmental Protection Agency, consists of a 20-acre wet detention pond, a sand filter and a constructed marsh. Water is detained in the pond for several days allowing heavy sediment, silt, organic matter and some clay to settle to the bottom. The captured stormwater slowly drains through the sand filter and cleaner water is released through pipes running under I-10 to the constructed marsh. It takes about a day for the water to make its way through the three cells of the marsh where each cell has different types of plants such as giant bulrush, pickerelweed and sawgrass. These plants take up nutrients from the water and also absorb other pollutants before the water moves slowly into Meginniss Creek and then Lake Jackson. 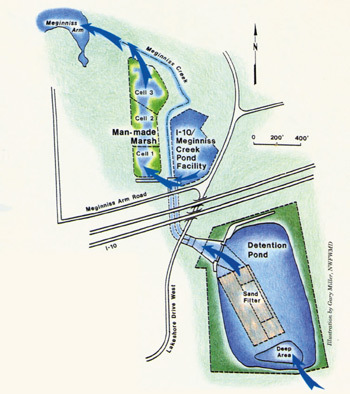 In 1993, the I-10 Meginniss Creek Pond Facility, using a classic detention pond concept, was constructed adjacent to the marsh area and was undertaken as a cooperative project of Leon County, Florida Department of Transportation and the Water Management District. This facility treats stormwater from the nearby interstate that had been by passing treatment. The Northwest Florida Water Management District and Leon County are cooperating on a new Regional Stormwater Treatment Facility for the Okeeheepkee Basin of Lake Jackson. The design of this facility will diverge from earlier concepts. It will incorporate extensive wetland creation to overcome a space limitation that precludes a classic pond system. Despite the lack of extensive open water, the advanced design of this facility is expected to provide pollutant removal values that exceed those of more conventional treatment. The area around the stormwater treatment facility will be a passive park with walking trails, interpretive signs that explain the stormwater treatment process and a wildlife observation platform overlooking the lake. 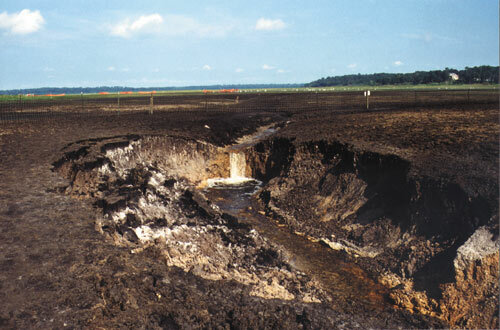 In the last stages, the southern portion of the 4,000-acre Lake Jackson drains into the sinkhole. Lake Jackson "disappeared" in 1909, 1932, 1935, 1936, 1957, 1982 and 1999. Porter Hole Sink just after the natural draining was complete. The large sinkhole on the right took most of the water. Muck is being scraped off the lakebed by earthmoving equipment. The project was divided into two major phases. Portions of the lake with the most degraded water quality and the most sediment accumulation were targeted first. Nearly 400,000 cubic yards of muck were removed from Meginniss and Fords arms in just three months during Phase I. 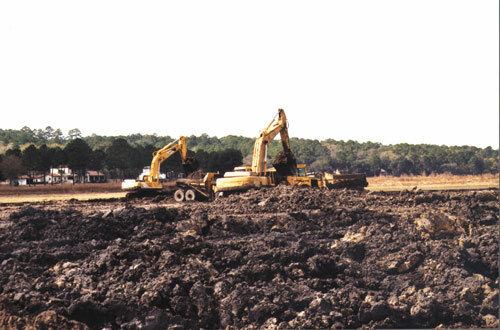 During Phase II, January 2000 to March 2001, approximately 1.6 million cubic yards of sediment were removed from areas farther out into the southern portion of the lake as well as from some additional areas near the northern and western shores. Sediment removed during both phases would fill a football field 100 stories high. Phase I of the project was completed before any major rainfall events, but work was temporarily interrupted during Phase II when tropical storm Helene deposited approximately eight inches of rain on September 22, 2000, flooding the southern portion. Hurricane Gordon, after being degraded to a tropical storm, had already dropped one inch of rain on September 17. Portions of the lake had to be dewatered with pumps to allow the completion of work underway. The Leon County Public Works Department oversaw the contractors performing most of the work although the Fords Arm portion of Phase I was handled by the Florida Fish and Wildlife Conservation Commission. The contracts were structured so work could be done incrementally as funding and other circumstances allowed. The bidding and construction management elements were somewhat unusual. Bidding was done on a unit cost (per cubic yard) basis only with no allowances for mobilization, demobilization or other ancillary costs. "Uncertainty about the working conditions in the lakebed and the unit cost probably resulted in higher bids initially," explained Macmillan, "because the contractors were taking a great deal of risk. For example, if three truck loads of muck were removed and then the project was completely rained out, the contractors would be paid for three truck loads only." Macmillan reflected that, overall, this approach ensured the wise expenditure of public funds. "The bidding and construction management phase was a little awkward, but a learning experience," he said. Earthmoving equipment was used to remove and load the sediment into dump trucks, which hauled the material to approved disposal sites. One of the first major obstacles to overcome was the identification of appropriate disposal sites. Over 100,000 dump truck loads of muck were removed from the lake. Sediment was deposited on contained upland sites and in the contractors' private borrow pits but most went to nearby private property. Removal costs ranged from $1.20 to $8.00 per cubic yard, with the average over the entire project being about $4.00 per cubic yard. Funding for the project was obtained incrementally, eventually exceeding $8.2 million, and came from a number of contributors: Leon County, Florida Legislature, Florida Fish and Wildlife Conservation Commission, Florida Department of Environmental Protection and the Northwest Florida Water Management District. An estimated additional half million dollars of in-kind services were provided for planning and implementation of the project. 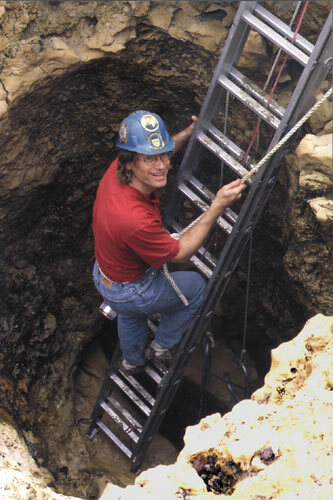 Thomas Pratt, of the National Florida Water Management District, climbs into the sinkhole. Many waterfront property owners were distressed about the sudden absence of water bordering their waterfront property. But an empty, dry lake bottom did present several other unique opportunities. 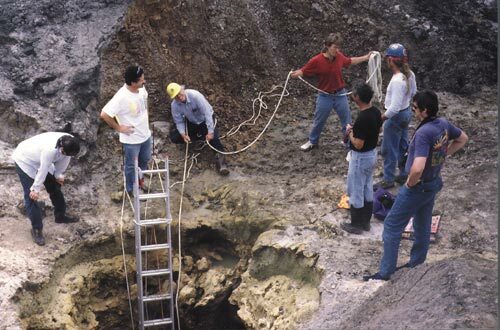 The drydown allowed local geologists to explore Porter Hole Sink and its narrow underground caverns, documenting the sinkhole cavity and geological features. The data obtained may offer a better understanding of the interconnection between the lake and the Floridan Aquifer system. Geologists from the Northwest Florida Water Management District and Florida Geological Survey prepare to explore the Porter Hole Sink cavity. Others watch the activity. This natural draining allowed the easier removal of an invasive exotic tree, the Chinese tallow, from the shores of Lake Jackson. Prescribed fire was undertaken on the lakebed to reduce biomass and improve habitat. Public boat landings and private docks were improved and repaired. Hundreds of area residents participated in several public trash pick-up events to remove litter from the lakebed and shoreline. Several boat motors, shoes, batteries, sunglasses, folding chairs and a boom box were recovered. Over three hundred area residents participated in a 5k run on the dry lakebed. Area residents biked, hiked or jogged on the dry lake bottom. Birding, hunting and horse-back riding were other recreational options. Traditional fishing gave way to "unique fishing" such as capturing or catching the fish stranded in some of the pools of water. When the lake was in the final stages of draining, fish were actually caught with bare hands as they were forced to congregate in small, shallow pools of water. For more information contact Georgann Penson or Tyler Macmillan, Northwest Florida Water Management Water Management District, 81 Water Management Drive, Havana, Florida, 32333-4712; (850) 539-5999.